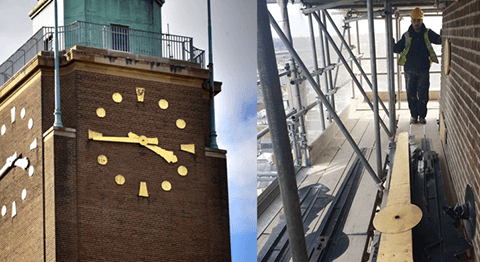 Having a head for heights came in handy today as we once again found ourselves working 200ft off of the ground on the landmark clock tower at Norwich City Hall. The iconic clock, which dates from 1938, has once again become faceless, or should I say handless! All four sets of huge hands have been carefully removed by Simon Michlmayr and clockmaker Stuart Smith and delivered safely back to our workshop. We will strip them down, remove any corrosion and repair them as necessary. Both sides of the hands will be primed and painted before the front of them is gold leafed in double thickness 24ct gold leaf. With the minute hand, the largest of the hands, being no less than 2.5 meters high, this is no small task. Of course, this is not the first time we have removed the hands, although last time there was a lot more hanging around involved….literally! In 2011, Simon Michlmayr and Craig Baird had to abseil down the tower to remove them. This was part of the major overhaul which we carried out. This time, however, it was a little less precarious. The previously erected scaffolding which was put in place for the repairs to the actual tower itself came in rather ‘handy’!